Lake George, a gem of the Adirondack Park in Upstate New York, is 32 miles long, 3 miles wide at its widest point, and reaches depths of nearly 200 feet. According to the Lake George Association, the lake as we know it was formed around 10-12,000 years before the present and has long been admired for its innate beauty. 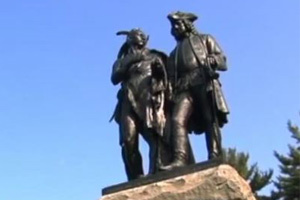 There is debate over who was the first non-Native American to discover the lake (was it Samuel de Champlain in the early 1600s or Father Isaac Jogues in the 1640s? ), but Jogues, a French Jesuit Missionary, named the body of water "Lac Du Saint Sacrement" - Lake of the Blessed Sacrement - in May of 1646. 110 years later, the French and Indian War (Seven Years' War) broke out over France's expansion into British Colonial territory. The Lac Du Saint Sacrement - Lake Champlain region was crucial for the British to secure since the French dominated Canada and areas to the north. The French were using Fort Saint-Frédéric at Crown Point, NY to control the use of Lake Champlain and prevent the British from colonizing that region, so British General Edward Braddock ordered Commander William Johnson to defeat the French forces at Fort Saint-Frédéric. As he traveled north, Johnson came upon Lac Due Saint Sacrement and re-named it Lake George for the British King. In September 1755, a series of three engagements between British and French forces broke out at the southern end of Lake George. These would collectively come to be known as the Battle of Lake George, which is commonly considered to be one of the first major victories for the British against the French. Fort William Henry was constructed that same year at the southern end of Lake George in order to guard the lake, protect British interests in that area, and serve as headquarters for any future operations should the French encroach from their strongholds in the north. In 1757, the fort endured and withstood two French attacks, the first led by Sieur de Rigaud de Vaudreuil and the second by General Marquis de Montcalm, perhaps the best French General at the time. The six-day attack by Montcalm and his 8,000 French troops, Native allies, and Canadian volunteers left Fort William Henry near collapse. British Lieutenant-Colonel George Munro agreed to surrender, so long as the English were allowed to retreat to the nearby Fort Edward. Montcalm agreed, but his Native allies were not pleased. When they could be restrained no longer, the Natives attacked the unarmed soldiers and civilians - including women and children - which resulted in massive loss of life. The exact death toll is uncertain, with some estimates as high as 1,500 and others ranging between 70-180. It is this massacre that was depicted, albeit inaccurately, in James Fenimore Cooper's The Last of the Mohicans. Montcalm and the other French officers risked their lives trying to stop the Natives, and once the conflict was settled, returned to burn Fort William Henry to the ground. 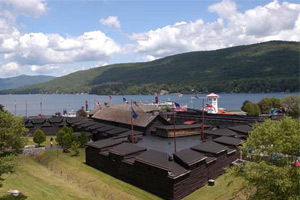 A replica of Fort William Henry was built in the 1950s, and that is the attraction you can visit in Lake George Village today. Although no Revolutionary battles were fought as close to Lake George as those in the French and Indian War, the Battle of Saratoga - the turning point of the Revolution - was fought about 30 miles to the south. There was also a conflict at Fort Ticonderoga, located at the northern end of Lake George. This conflict resulted in that fort's being burned and abandoned. When you visit Lake George, you'll see that history is everywhere. There are signs on the side of roads marking important sites, monuments in parks honoring fallen war heroes, and even some of the lake's most popular attractions are named from its history (like the Lac du Saint Sacrement, the largest boat in the Lake George Steamboat Company's fleet, that was named after the lake's original moniker). While you absolutely should enjoy boating, golfing, parasailing, horseback riding, and a multitude of other activities while you're in Lake George, we strongly suggest that you set aside some time to visit local historical sites, like Battlefield Park, Fort William Henry, Fort Ticonderoga, and Saratoga National Historic Park. 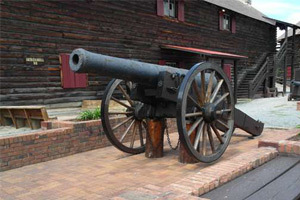 The Lake George Region truely does have a rich, unique history that can still be appreciated, even today.